Day 34: Hannibal, Mo. to Peoria, Il; Total Trip Miles 8448 (kilometers: 13,595); Kids Playing Baseball on a Sunday Afternoon; An Early Happy 4th of July Message. Yesterday, on my ride to Peoria I hit the back roads again. Highway 24 was a bit bumpy as I rode past fields of soybeans and corn. The corn was dark green and lush. So tall that sometimes I couldn’t see over the top of it. “Knee high by the fourth of July” my old pappy used to say and this corn would have no problem beating that goal. Scattered along the roadside were beautiful wildflowers: buttercups, black eyed Susans, Queen Anne’s lace, some purple flowers that looked like asters, and coral colored lilies. I love riding through the small towns. Coming into Rushville I spotted a bunch of cars parked near a baseball field, and I pulled over and parked. It seemed like you had a choice of a purple tee shirt if you were a Rushville All-stars fan or an orange Macomb Bomber shirt if you were a supporter of the visiting team of 9 and 10 year olds. I stood out a bit with my long hair, thick bike trousers, big boots and a sleeveless black Harley shirt with a skull on the pocket. Nevertheless, the men and dad/coaches were friendly and the women smiled as they pulled their youngins in closer to them as I walked around. Then silence descended, a young girl started singing the National Anthem, folks stood up and put their hands on the hearts and a cheer went up at the end. The umpire called the coaches to home plate, lineup cards were exchanged, local rules explained and a batting helmet was tossed out because it had a crack in it. I love baseball. Not necessarily watching it but going to a game, and the smaller the game the better. Little league matches. Semi-professional – where you can get close to the field, hang on to the chain link fence, smell the cut grass and remember when you were a kid. I thought about my time in Northern Ireland and how some of us got a little league team going. It was a challenge trying to explain the rules to kids who had never seen a game before. To constantly remind them that no, they weren’t allowed to actually throw the hard baseball at, and try to hit, the opposing player in order to get them “out”. It wasn’t easy teaching the Irish kids how to throw a ball overhand since all their sports involved kicking balls or batting them. Over and over we had to show them which hand to put on top of the bat they were swinging. There were no designated baseball fields in Ireland (we brought our own bases and put out cones), no fancy uniforms, though that would come later (once we found a team to play – our nearest competitors were two hours a way down in Dublin. ), no announcers, no anthems but every kid would play. I thought about how wonderful a gift baseball was –not only to the kids playing, the grandparents watching but an unarguable gift and blessing to the world, since it is now played internationally. Ireland itself has had a very successful child and adult national team for quite a few years now. In this time of political divisions in our country and a sometimes sullied reputation abroad it helps to remember that three of the greatest gifts the USA has given to the world are: The American Constitution, Jazz music and baseball. The vision of democracy and equality, the thrilling inspiration of the arts and the sheer joy of respectful competition, good sportsmanship and camaraderie. Day 33: Brookfield, Missouri; How Hot is it? ; Heading to Hannibal; Stinky Pete; Sending Blessings. I’ll confess I’m Stinky Pete. Too much sweating today. It’s just so damn hot on the bike. Not as hot as it was when I was riding in California and Utah the other day and it got up to 114 (45 Celsius)! I remember that day well because I kept seeing short men marrying tall women just for the shade. The cows were giving evaporated milk. It was so hot that as I drove down the interstate I could watch the corn popping in the fields. Well, you get the idea. Besides the heat itself the other problem on hot days are tar snakes – the black tar lines on the road that they used to patch it. It becomes slippery in severe heat and you can feel your wheel slide on it. You also have to be careful parking the bike because the kickstand can sink into the tar. Some bikers bring a small flat piece of wood to put under the kickstand and use it in any unsteady ground conditions. I’m heading to Hannibal, Missouri for tonight. About another 100 miles. That’ll leave me with only 175 miles to get to Peoria tomorrow. Should get there in time to watch the USA soccer game tonight. Unfortunately, Northern Ireland lost this morning but Ireland plays tomorrow. I’m cruising Hwy 36 the rest of the way in. Not much to do but just enjoy looking at the cornfields rolling by and watching out for deer. Thinking of my great friend Corinna who’s getting married today and wishing her and Michael blessings. Praying for old girlfriends and family and friends. Hey, I got a lotta time. There’s so much to be thankful for when you just slow down, stop worrying about time and destinations, what you have and don’t have and simply appreciate the preciousness of each moment. What do you have to be grateful for? Who do you want to thank? I thought getting from Dodge City Kansas to Lindsborg would be a piece of cake. 150 miles. I wrote down the route numbers, put the paper in my see-through magnetic bag on my gas tank and headed out happily. Then proceeded to get lost. Took me about 200 miles to get to there but I made it! Last time I set foot in that town was 34 years ago. The highlight of the day, and the purpose for going there, was meeting up with my old buddy David Norlin, in Lindsborg. David helped me get my first social work teaching job at Bethany College in 1981. (Yes, I’m old!) I taught with him there for a year. David and his family made the town and my time there magical, one of my all time favorite memories. He showed me my old house and the college and toured the town, especially good was having a beer in the old bar, the Stuga. Those were some wild, wonderful times. We caught up on events, our kids, former faculty and former students. I’ve always admired and respected David. A man of humor and great integrity. We kept in contact for years but then lost touch when I moved to Northern Ireland. Pecos Bill never showed up to give us a lift today and so Big Red and I hightailed it to Topeka to get at least another 100 miles under our belt. Now 450 miles to go to get to my next major destination. Then we’ll see how things plays in Peoria. 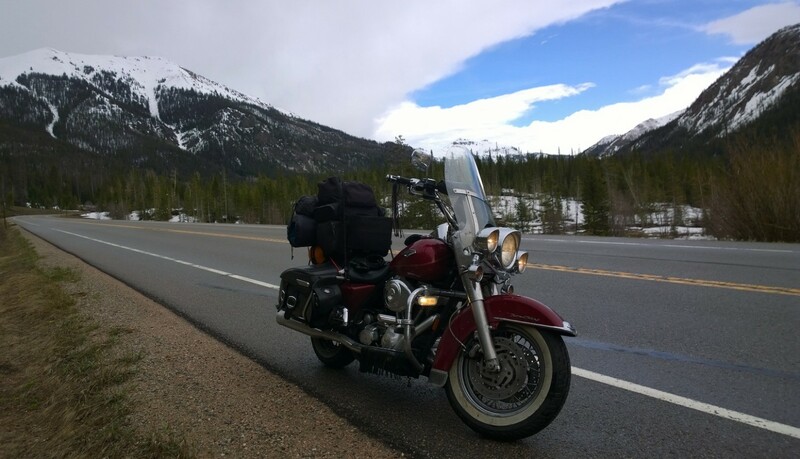 Day 30: Pueblo, Colorado; Crossed Continental Divide at Monarch Pass – elevation 11,312 feet (3400 meters) 61 degrees! Hunkering down in a Super 8 motel in Pueblo, Colorado 11 hours after I left Ouray. I’m completely exhausted so I’ll write more about today, tomorrow. Heading toward Lindsborg, Kansas and then Peoria, Illinois. Ride safe and full of gratitude. I was on Highway 50 in Colorado at the front of a pack of cars and I should have figured something was wrong when they all turned right at a traffic light and I kept going. “What do they know?” I thought and continued – now in the wrong direction. But it was a beautiful road, the weather was getting cooler and I was riding through mountain passes, gorges, could see snowy peaks in the distance and had a river running alongside me. So I came to the town of Ouray and I still didn’t know I was on the wrong road but I was thirsty and Big Red virtually came to a stop in the road. I looked to my right and understood why Big Red had stopped. We were outside O’Brien’s Irish Pub. It reminded me of the scene in the movie The Quiet Man where Michaleen Oge Flynn’s horse instinctively stops right outside Cohan’s Pub. So I parked Big Red and looked around. Across the street was a microbrewery. The name alone was enough: The Mr. Grumpy Pants Brewing Company. So I went across the street and got a nice blond beer. When I sat down on the porch and checked my phone I realized I was in the wrong town. But it felt so much like the right town! So I booked a room about two blocks away and walked across the street to O’Brien’s Pub and watched the USA – Argentina game. A disappointing loss but a great Guinness beef stew and a Mexican Logger Beer. Sometimes getting lost is the best thing that can happen to you. Day 28 Recap: Green River, Utah; Watching Northern Ireland play Germany in Soccer (on the internet); Much Better Ride Yesterday. I’m all packed up, sitting in my Motel 6 room, hoping to watch the first half of the Northern Ireland football match before housekeeping kicks me out. It was hot again when I left Mesquite, Nevada. The temperature on my phone said 107 degrees, so I prepared myself for another rough day riding. I put on my long leather gloves to protect my fingers (yesterday my fingers were air roasted because I had on fingerless gloves). It was rough at first and I managed only about 40 miles before I stopped at the Black Bear Diner in St George. Best homemade sausage patties I’ve eaten on the trip so far! Prior to getting to St George I drove through the Virgin River Gorge. Desolate desert and high hills. The only things growing were bleached green shrubs and pale pastel colors. I cut my speed to 65 mph so as not to strain the engine in the heat and limped down the interstate. The desert mesas were clay colored with sparse patches of green shrubs on them, looking as if the mesas hadn’t shaved in a few days. In this heat, who could blame them? After St George brighter colors began to appear among the high mesas and buttes. I was never bored with the changing scenery and colors and canyons similar to the Grand Canyon. I passed through the San Rafael Swell. Imagine your image of Mars or the planet Vulcan, because this is where they filmed it for the Star Trek movie. Limestone, shale and sandstone. Red rock canyons, deep valleys and gorges. Dome shaped rocks and buttes shooting up into the sky like fossilized rockets or abandoned chimneys. In the distance I could see snow still hiding on the mountain tops. Amazing. I felt very humbled and grateful. I nickel and dimed my way down the hot interstate, stopping every 50-80 miles to get a break from the heat. I found a store with a beer cave and spent about 10 minutes inside in the cold air until the clerks started to stare at me. I gassed up Big Red and filled myself with water. Even stuck some in my pockets. The road gained altitude, climbed to 7000 feet and it began to cool down. “No Services for 100 Miles” a sign read. What the hell, let’s go. The last hour of the trip was awesome. The sun was setting and the sky was filled with hues of pink, honey-apricot, Spanish moss grey and various blues. I stopped and took a photo which I’ll try to attach. Made it to Green River. Today, Day 29 I’m going to continue on I 70 to Grand Junction then I’m going to hop on Hwy 50, The Loneliest Highway in America. PS: Northern Ireland lost 1-0 but still have a chance to make the playoffs. Tonight the USA plays.